Pets are crucial parts of our lives and our families, yet most pets aren’t thought of in the design process of a home or when you’re picking furniture. Pets should be as comfortable in your home as you are! 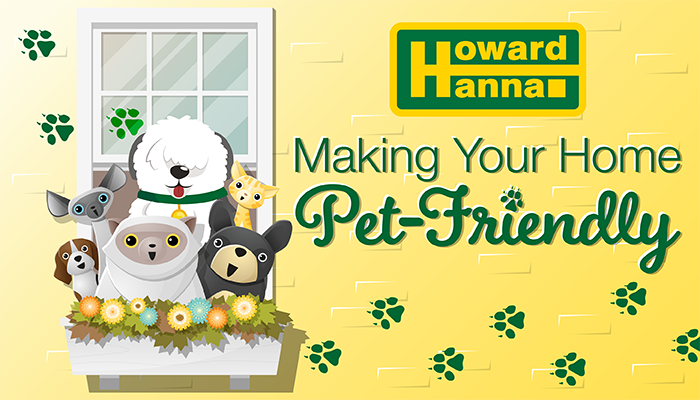 Keeping your home pet-friendly will make both you and your pet feel at home. Are you moving with your furry or feathered friends? Check out these tips for moving with pets! Start by making sure your home is healthy for your pet. Take a look at outdoor plants. Many plants are hazardous to pets and can harm their health or well-being. Remove any dangerous plants from your gardens and plant pet-friendly things! Also be aware of any lawn care that might harm your pet. Ask lawn care professionals what they are using and always remind them of any pets that are in your home. Make sure any household plants are pet friendly as well. Consider getting rid of dangerous plants or placing them in places your pet can’t get to. Check the decorations and furniture in your rooms. Look for cords or wires that could harm your pet if nibbled on or broken. Move items that are easily broken and place them in safe spaces, like a china closet. Heavier or more solid items that can withstand a fall will make better decorations, especially with active pets. Small decorations can be choking hazards to curious pets, so stick to larger items when styling a room. Pets that like to climb should have a space to do so, be it climbing posts or empty shelves. Give your pet a private, quiet space for escape when they need time alone. Just like you need space, sometimes your pet does as well. Different types of furniture work better for different pets. For a more active pet, avoid furniture with sharp corners and edges, as these can cause them harm during playtime. Stain-resistant fabrics will be a blessing against pet messes. Look for furniture with “indestructible” fabrics, like Crypton, a synthetic fabric that withstands stains, smells, bacteria, and dirt, or Ultrasuede, which is machine-washable. Avoid velvet, silk, or chintz. If you want to keep pets off the furniture, make sure they have a comfy space of their own, like a bed or private nook of the house. Flooring is important for pet owners to consider. While wood is appealing to the eye, it might not withstand pet nails, especially those of larger pets. If choosing wood flooring, consider looking into a harder wood that can withstand high traffic. You can also protect high-traffic areas with runners or rugs. Ceramic tile or painted concrete flooring is great for pets, as it is heavy duty, easy to clean, and also gives your pet a cool place to lie on a hot day. Carpet traps smells and dirt, including pet hair, and can be difficult to clean. If carpet is a must, consider a low pile option and avoid continuous loop, as pet nails can get snagged, causing injury to your pet and damage to your carpet. Make sure there is enough space for your pet! If you have a pet that enjoys the outdoors, give them ample outdoor room to roam. If your backyard is small, consider opting out of lawn furniture or choose easily removable pieces to ensure enough space for your pet. Pets bring joy into any home and deserve to be considered when making decisions about your home. Small changes or updates can have a huge impact on your pet and can make your home feel like home to them.